Despite today's low gas storage, the market is oversupplied. The market consensus has priced in continued oversupply going forward, but early evidence suggests a meaningful production slowdown in 2019. As slow supply growth undershoots consensus expectations, I see high odds of a tighter market and higher prices in the second half of 2019. Today, the natural gas (UNG) market is oversupplied and prices remain stubbornly around $3 - about the same price as 6 months ago. However, I still believe prices could soar as we move through 2019. The reason? Production will fall short of market expectations. 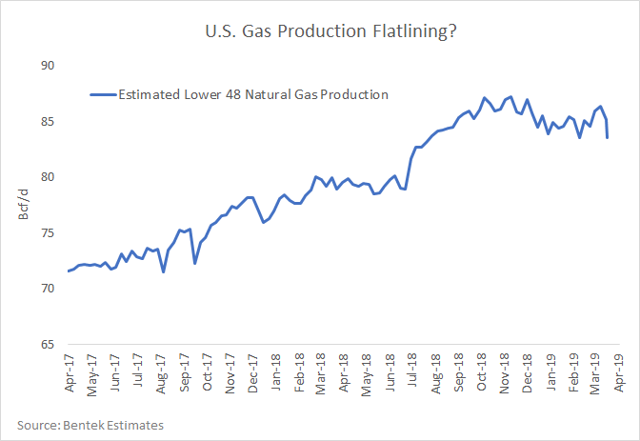 In this article, I'll explain why natural gas production growth will slow dramatically in 2019. This slowing production will meet the new demand growth in the second half of the year, tightening the market and sending prices much higher. But first, let's see where the market stands today. On the surface, this storage deficit might seem to indicate an undersupplied market. But today's deficit is purely a function of a low starting point. You see, we entered last winter with the lowest natural gas inventory in 13 years. This low starting point combined with an early-November cold blast to ignite an epic short squeeze, fueled by offsides traders - like the now-infamous OptionsSellers.com. (And don't let the weepy-eyed apology video fool you. Anyone with even a cursory knowledge of derivatives knows the immense risk of selling naked commodities options on leverage. OptionsSellers.com did not suffer from a "rogue wave." They could have easily hedged their risk by selling call spreads instead of naked calls. But that would have given up their potential upside. So they sold naked call options for maximum gains and thus exposed their clients to catastrophic risk. That's just greed, plain and simple. And now I'll jump off the soapbox). After November's brief short-covering rally, one of the warmest Decembers in years was followed by an unseasonably warm January, sending gas demand and prices tumbling back down. And despite gas inventories plumbing 4-year lows, prices remain stubbornly below $3 on both a spot basis and through much of the 2019 - 2020 forward curve. 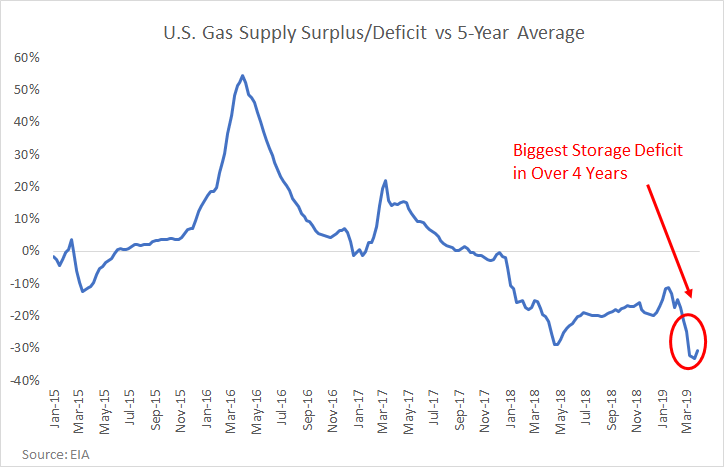 That means traders are convinced that an oversupplied gas market will erase today's gas deficit during the upcoming storage refill season (April 1st through October 31st). 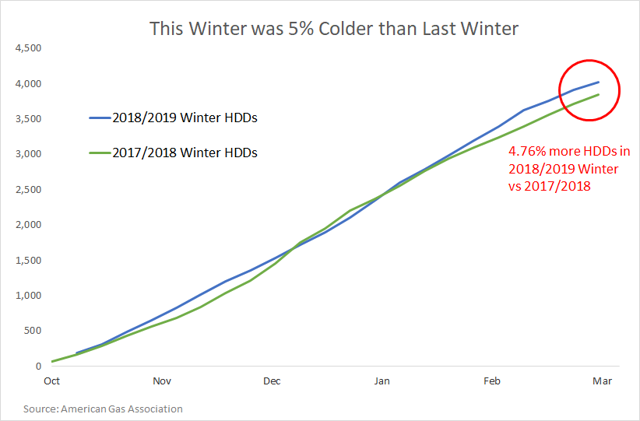 First, let's compare the coldness of this past winter (2018/2019) versus the previous year (2017/2018) using "heating degree day" (HDD) data. Heating degree days simply measure how cold a given region is versus a baseline temperature. In the U.S., the standard baseline is 65 °F. So a 35°F day would generate 30 HDDs, and two 35°F days would generate 60 HDDs, and so on. As a very rough approximation, this winter's 5% greater heating demand and 17% lower storage draws implies we were oversupplied by about 475 billion cubic feet during this past winter, or roughly 3 Bcf/d. (Author's Note: Don't take this as gospel; it's a very rough approximation for the sake of argument.) Now, 3 Bcf/d might not sound like much on the surface, but consider this…. The U.S. ended the winter gas drawdown season with 1,107 Bcf of gas in storage on March 29th. That's 505 Bcf below the 5-year average end-of-winter storage level of 1,635 Bcf. 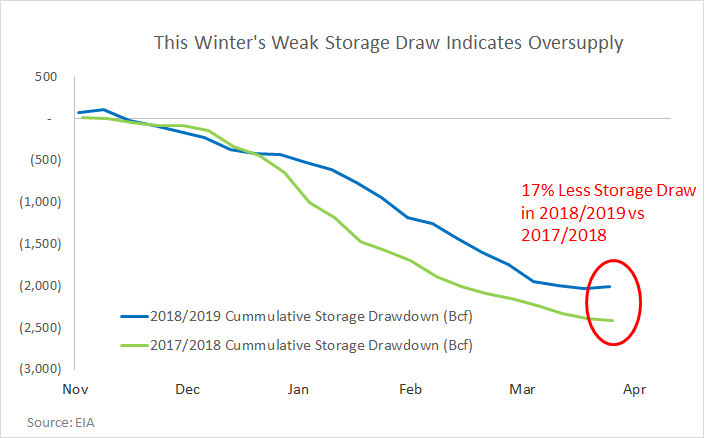 And with the storage refill season spanning just over 200 days, you can see how a persistent 3 Bcf/d surplus could generate over 600 Bcf of excess supply. That would transform today's 500 Bcf deficit into a mild surplus by the start of next winter. Now that's just a hypothetical example, but it happens to fall within the ballpark range of the official projection from the Energy Information Agency ("EIA"). In the EIA's latest short-term energy outlook, the agency projects that we will almost completely erase today's storage deficit and end the refill season with gas storage just 1% below the 5-year average. Said differently, the EIA projects that in the 213 days from April through October, the market will supply an excess of roughly 500 Bcf - or 2.3 Bcf/d. 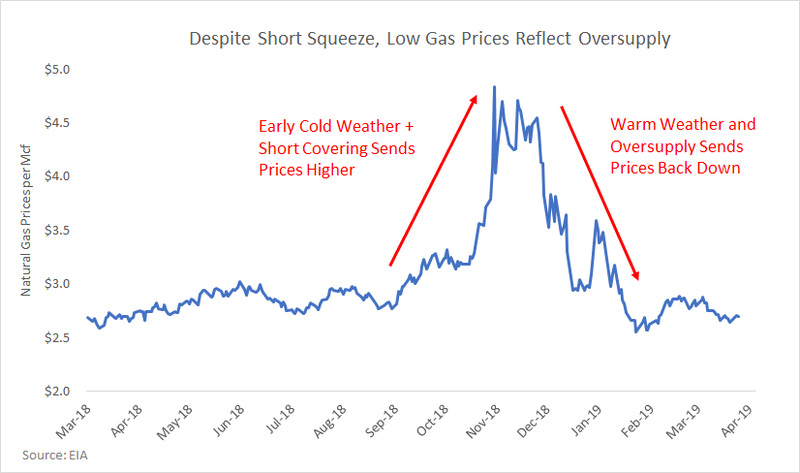 And with nearly every gas futures contract in 2019 trading under $3, the market consensus has priced in a similar forward outlook. Do you believe the EIA production forecast? I recently explained how investor demands for less growth and more cash generation were forcing producer restraint in the shale patch. That trend is showing up in capex cuts across every major shale gas producer I track. The list includes EQT (EQT), Range Resources (RRC), CNX Resources (CNX), Antero Resources (AR), Southwestern Energy (SWN), Cabot Oil and Gas (COG) and Gulfport Energy (GPOR). If this trend persists, there's every reason to believe that Appalachian production growth could slow dramatically in the region. 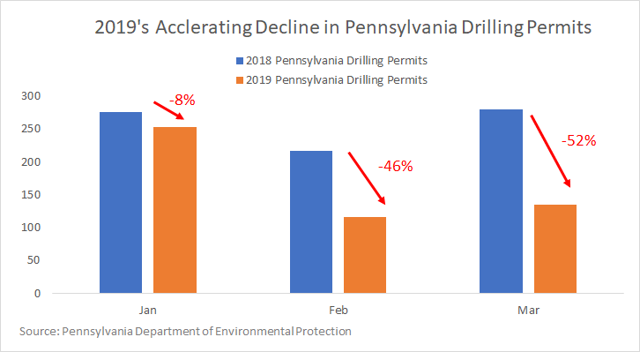 And this drop in drilling permits becomes even more bullish when you consider DUC (drilled but uncompleted) well dynamics. Last year alone, Appalachian drillers burned through nearly 200 DUCs to deliver 2018's record production spurt. And with only about 500 DUCs left in Appalachian inventory, can they repeat this feat in 2019? Unlikely. Remember, over the last few months, investors have clamored for shale companies to start generating free cash flow. So there's never been a greater incentive for shale drillers to tap DUC inventories and boost cash flow with minimal capex. And yet, the rate of DUC drawdowns has slowed to a crawl. Occam's razor says Appalachian shale drillers have stopped tapping their DUCs for one simple reason - they've run out. This is just my hunch, but time will tell. 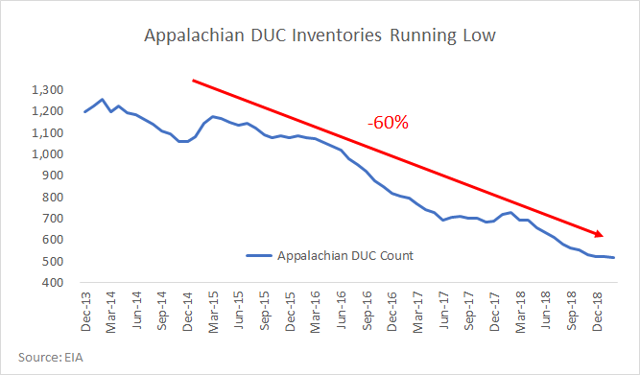 The bottom line: less capex plus lower DUC inventories equals a big drop in Appalachian wells coming online in 2019. Less wells mean a lower rate of production. And the early production data so far confirms this view. Has U.S. Gas Production Stalled? This January, U.S. gas production fell to 88.6 Bcf/d, down from 88.9 Bcf/d in December. Admittedly, that's a small decline. But remember, we don't need an outright decline to balance the market. Anything less than blistering growth is a big positive for balancing the market, and a small decline is even better. That's because of the huge new demand coming online from ramping U.S LNG export capacity, plus pipeline exports to Mexico and gas-fired power demand. Of course, these estimates could get revised higher in the coming weeks. But for now, it's simply one more piece of the production puzzle indicating a meaningful slowdown in the rate of growth this year versus 2018. As we move into the second half of the year, we start lapping last year's massive production increase. That means shale drillers will need to step on the gas to hit the EIA's 7.6 Bcf/d production target in the second half of the year. But based on the depleted DUC inventories, lowered capex, and collapse in Pennsylvania drilling permits - I see low odds of that scenario unfolding. That's why I remain bullish on natural gas as we move into the second half of 2019. Disclosure: I am/we are long RRC. I wrote this article myself, and it expresses my own opinions. I am not receiving compensation for it (other than from Seeking Alpha). I have no business relationship with any company whose stock is mentioned in this article.